If a film based on author Nicholas Sparks’ work is like an over-produced power ballad with a 128-piece orchestra, writer/director Ami Canaan Mann’s “Jackie & Ryan” is the non-ironic acoustic guitar cover of the same tune. The attitude is comparably less immediate, the rhythm is even a bit more contemplative, but its form, and intent, has barely changed. The Sparks brand certainly lingers over this other modern romance, indeed one that features handsome Americans in a shiny story of their movie poster-friendly embraces. The tale here is of two title characters whose paths of different starting points intersect, creating a symbiotic relationship that eventually shuffles into passion. Jackie (Katherine Heigl) is a once-famous musician who now lives with little money in her hometown of Ogden, Utah, while embroiled in ugly phone chats about custody of her daughter Lia (Emily Alyn Lind) with her estranged husband. When walking through downtown one day, she observes a rugged musician named Ryan (Ben Barnes) busking away on a folk tune, and notices that he only does covers. “Ain’t got nothin’ to say?” she chides him. While this moment might technically be their meet-cute, it’s only when Jackie is knocked down by a comically slow-moving truck that the two connect. Through his charm and handy knowledge of roofing, he sticks around a few days with Jackie and her mother (Sheryl Lee). In a short amount of time, the two inspire each other: Jackie continues to push Ryan to write his own songs, while she finds comfort in his detachment from the types of things that can hold a human being down, which motivates her to stand up to her husband. 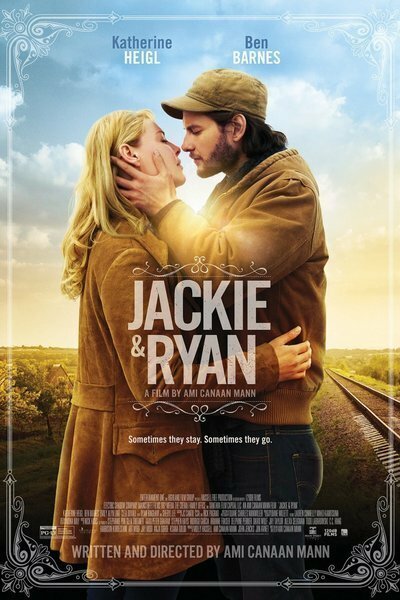 After the script establishes an overall environment of hardship, it’s only then that Jackie & Ryan explore their romantic connection, which turns out to be the script’s least intriguing facet. Barnes & Heigl take their characters the distance provided them by the story, which is not very far. Barnes has a weird gloss in his hobo-ness that renders him a boring fictional being fairly quickly, unchanged even when movie begins to idolize him. And as her character seeks divorce, Heigl spends half of her time acting with phones, and the other half with a plain stoicism. The two are both fine in the film, together and separately, but their chemistry is emblematically unspectacular. Trying only sometimes to not be the Nicholas Sparks answer to "Inside Llewyn Davis," “Jackie & Ryan” is constantly conflicted with its levels of earnestness. Ryan’s world of wandering (homelessness) is given ample time for presentation, but like Barnes’ GQ drifter looks, is too tidy. Or, Jackie’s battle for custody is an intriguing issue for a character to deal with (and to be inspired by a folk singer, nonetheless), but is given such a fleeting representation and resolution. Even the film’s idea of romance seeks to scrub Sparks’ small-town arcs of their rampant third act deaths, or tedious separations until one fixes the other, but the heart of this film grows weaker as its meant to go bigger. It becomes a companionship story of two people who can have each other, we don’t really care. Emblematic to how slippery this movie can be, “Jackie & Ryan” aims true where most other musician-led films don’t - in its scenes of performance, Heigl is actually singing, and Barnes is actually playing. Mann's romance is saved most of all from genre obscurity by the heart found in some of its sights and sounds. The backdrop of Ogden, Utah presents a community with a sense of character and culture, from its quaint main street to its heavily-populated fest dedicated to folk music fiddlers. Even the house that’s used for Jackie’s family has a memorable beauty, its dreamy front porch views to open mountainsides providing portions of sumptuous cinematography (from Duane Manwiller) that’s more memorable than the dialogue it co-stars with. Writer/director Mann seems to have her aspirations betrayed most egregiously by editing, which makes this film a mess on its own. Worse than that, none of its key offerings fully develop. Contemplative montages sometimes stumble audibly, as when characters are shown playing instruments while a separate score can also be heard. And the story’s grand finale, meant to express what Jackie & Ryan have taken away from their encounter, doesn’t just skip on providing viewers a little narrative compassion, but an explanation of what the characters are even doing. When considering what motivated Mann to write and direct this film, you can understand where her inspiration started. The music, the mountains, a different way to face life and love, etc. You’re just not sure where she drifted off to.